This was a building in San Francisco that was being converted into a gym. 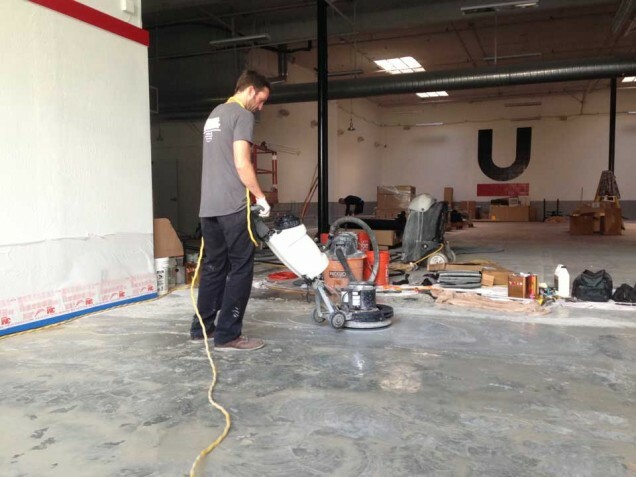 The owners wanted to restore the concrete floors in the front lobby area. The concrete had layers of adhesive and paint from the previous floors. The job turned out to be more of a concrete stripping service than anything else. Diamonds would not have done much to the floor unless all the adhesive and paint came up. I applied stripper to the concrete and let it marinate. I used a weighted floor machine with a stripper pad on the bottom to help get up the adhesive and paint. The owners wanted some of the color from the adhesive and paint left on the floor. I did my best to leave a even distribution of color to give the concrete a more industrial unique look. After the concrete was stripped we let the concrete dry for a couple days before coming back to seal.